LG H&H reports net sales of 1.3 trillion won, and operating profit of 178 billion won for 1Q 2015. Versus 1Q 2014, net sales grew +15.4%, and operating profit grew +39.1%. April 21, 2015 – In 1Q 2015, LG Household & Health Care, Ltd. (CEO: Suk Cha) reported the highest quarterly sales of 1.3 trillion won (+15.4% yoy), and the highest quarterly operating profit of 178 billion won (+39.1% yoy). Beautiful sales increased 34.5% yoy, leading total sales growth, and operating profit increased 64.0% yoy, surpassing 100bn won. 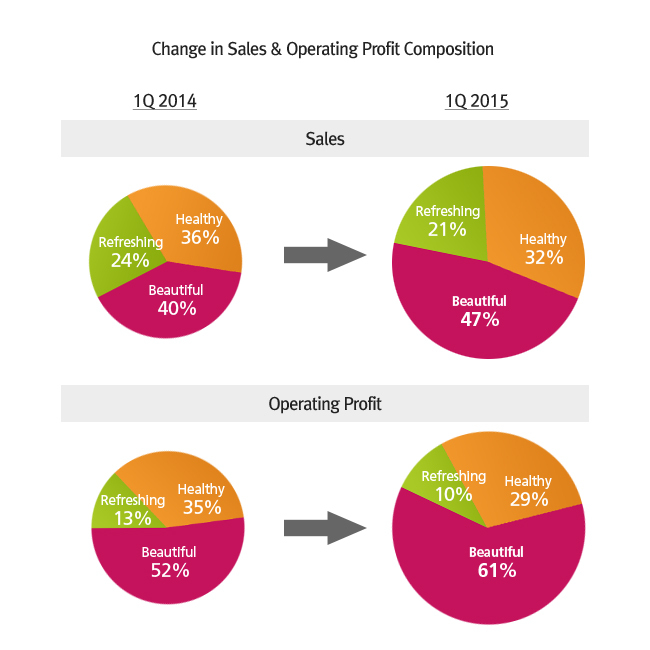 Vs. 1Q 2014, contribution from Beautiful increased from 40% to 47% in sales, and 52% to 61% in operating profit. In domestic major DFS, ‘Whoo’ maintained the #1 sales brand position in all categories including high-end jewelry and watches. 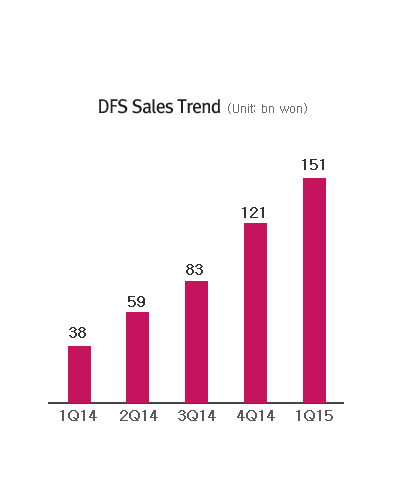 Such strong performance of ‘Whoo’ helped DFS sales to surpass 150bn won. Healthy sales increased 3.5% yoy and operating profit increased 16.2% yoy, even under unfavorable business environment from market contraction of major categories. Sales of major categories increased 17.4% yoy, and M/S also increased to 36.0%, further strengthening the #1 position in the market. Refreshing sales increased 1.1% yoy and operating profit increased 2.2% yoy, despite of continued slow market since the Sewol Ferry disaster and increased labor cost pressure from enlarged scope of ordinary income from 2H 2014. Sales has increased for thirty-nine consecutive quarters since 3Q 2005, and operating profit has increased for 40 quarters since 2005, excluding 1Q 2014. 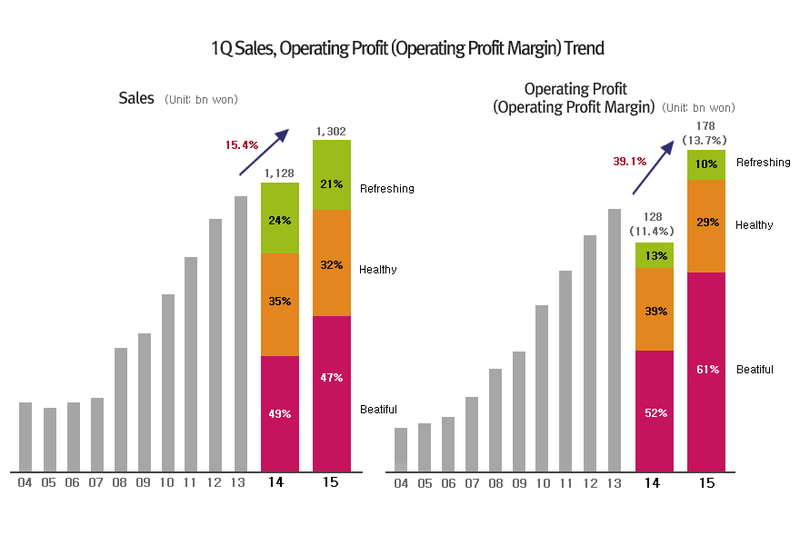 Both sales and operating profit have delivered continuous growth for more than 10 years.